It’s hard to believe that autumn is just around the corner. 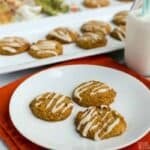 Perfect time to make some gluten free pumpkin cookies that taste great but only have one gram of carbs per serving. 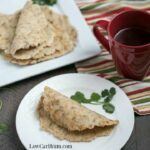 Although I realize the whole pumpkin spice theme gets out of hand around the holidays, I still love to use it in my recipes. 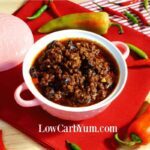 Actually, it’s become so popular, that these days, you can find recipes for all sorts of dishes all year. In fact, as I point out in a previous recipe for chocolate chip pumpkin cookies, I have also made pumpkin chia pudding, pumpkin lasagna, and pumpkin bread. And not just in late autumn. Canned pumpkin puree is one of the few foods that I buy in a can. However, these days, you don’t have to worry nearly as much about BPA. In case you’re not sure what BPA is, it’s an industrial chemical that’s in the metal lining of cans. If you don’t consume a lot of foods from cans, there’s probably not much to worry about. However, if you’re female and concerned about estrogen dominance, then you probably want to avoid cans with BPA as much as possible. 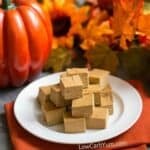 I know some of you low carbers might be reluctant to eat much pumpkin puree because of the relatively high carb count. In fact, one cup of it contains 20 grams. But keep in mind that there’s also 8 grams of fiber. Beta carotene converts into vitamin A. But few foods other than, say, liver, for example, contain pure vitamin A. But the fact that there’s so much beta carotene and a good amount of it will convert into vitamin A is reason enough for me to eat the fruit innards of the pumpkin vine. Moreover, pumpkin is rich in vitamin C and iron. So whadya say … are you ready to get back in the holiday spirit and make some? This recipe requires a lot of ingredients. But in the end it will be worth it. You’ll probably feel like you’re a mad scientist by now with all your lab equipment. Hang in there. Focus. Just a few more steps…you’re in the home stretch at this point…. Finally … it’s time to bake. 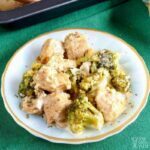 Set your oven at 350 and bake for 12-15 minutes. Before removing from the pan, allow the cookies to cool. 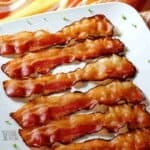 (photo 14) You can save some time by putting them in the fridge. 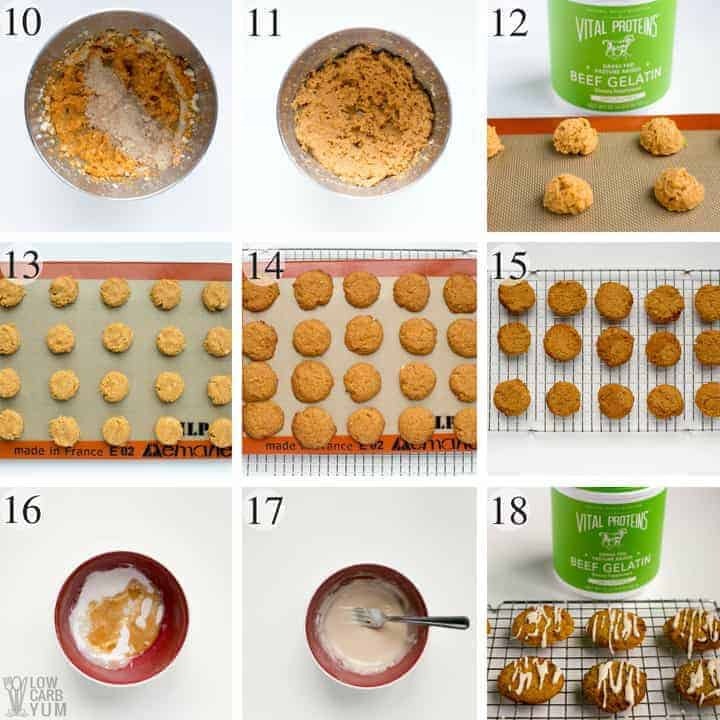 Make sure the cookies have cooled completely before removing them to a rack or plate. (photo 15) Removing them too soon can cause them to break apart as they aren’t fully set until cooled or chilled. I also have some directions for the optional glaze. It’s just a mix of powdered sweetener, vanilla extract, and almond milk. (photos 16 & 17) You may need to adjust the liquid to get the right consistency. Just make sure you drizzle the glaze. (photo 18) You don’t want the glaze to overwhelm the rest of the cookie. 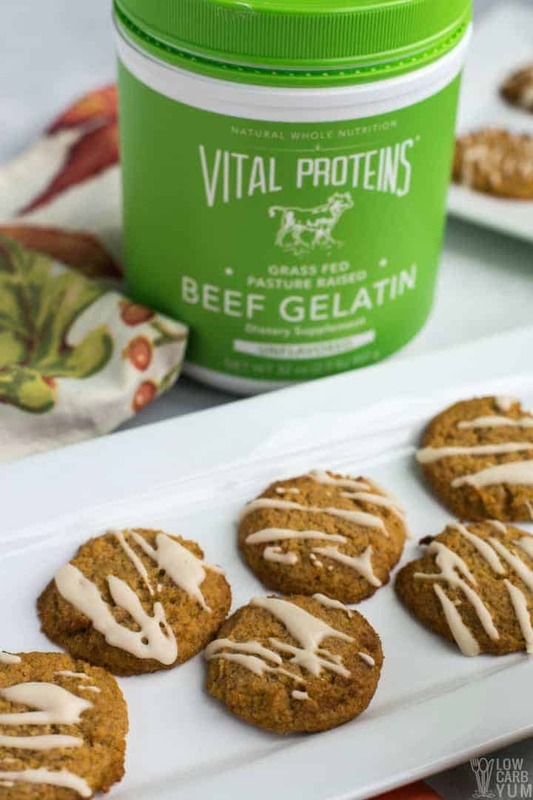 For this recipe, I’m using Vital Proteins beef gelatin. 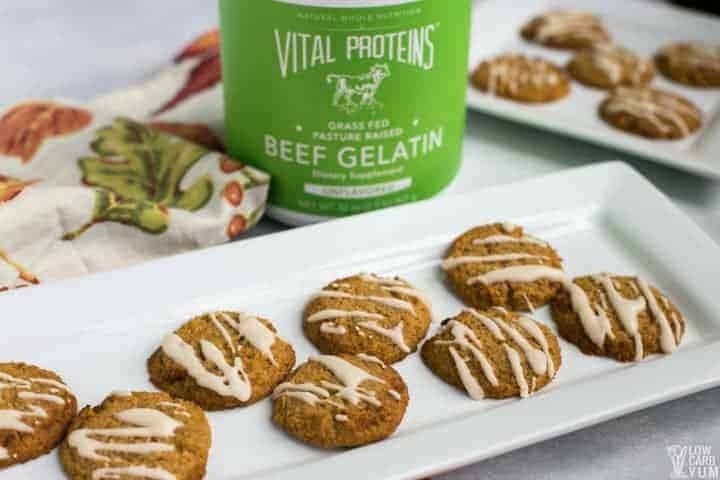 Now, if you’re new to baking low carb desserts, you might be wondering, “Why on Earth would I want to eat a cookie that tastes like beef? Well, first of all, the gelatin is unflavored. It does come from cow hide, but you can’t taste it. And, it’s the ingredient needed to bind these cookies without adding an egg. 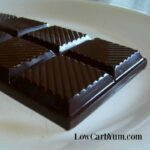 The gelatin is a great source of protein and it’s low inflammatory. It’s basically collagen protein that has been cooled. 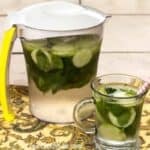 It contains the amino acids that may help regenerate your own collagen that acts like a glue for your skin and other tissues. Gelatin is great for using as an egg replacer in baking. It’s tasteless and doesn’t have an overpowering texture. However, it can be difficult to work with. I find that fluffing the gelatin up with water and bulk sweetener is the best way to replace eggs in baked goods. 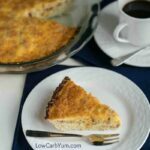 This treat is great for those who are not only watching their sugar intake but also for people who need to be lactose-free and gluten-free and have an egg allergy or sensitivity. Let me know what you think of the cookies. My family loves this treat … all year long. 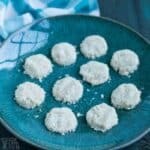 Even if you don’t have any issues with whole eggs or just the whites, these are some pretty good gluten free low carb cookies to indulge in! 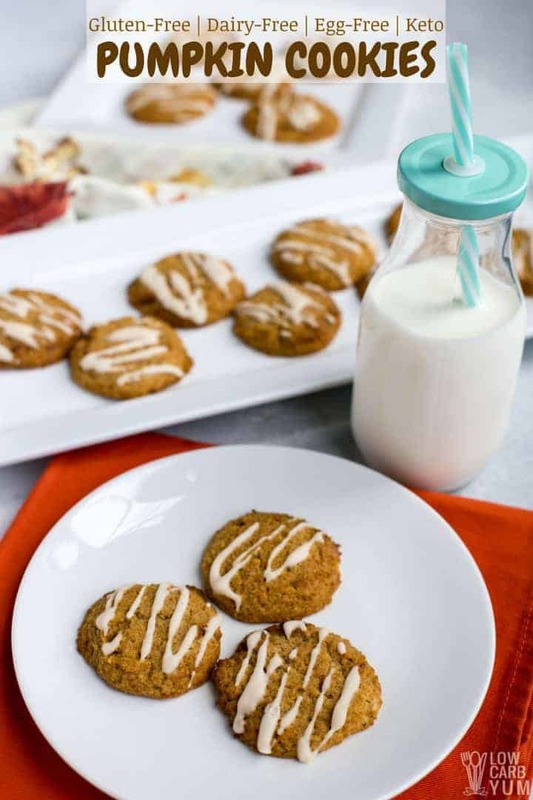 Enjoy these dairy free and egg free cookies! And if you give them a try, be sure to let us know what you think in the comments. It's hard to believe that autumn is just around the corner. Perfect time to make some pumpkin low carb cookies that taste great. Combine almond flour, coconut flour, baking soda, baking powder, cinnamon, ginger, cloves, and sea salt in small bowl. Set aside. In a medium bowl, combine coconut oil, pumpkin puree and vanilla extract. Set aside. Place 2 tablespoons room temperature water in a separate mixing bowl and sprinkle gelatin on top. Allow to sit 5 minutes. Add 1/4 cup hot water to the gelatin mixture and whisk until gelatin is completely dissolved. Add granular low carb sweetener and beat until mixture is white and fluffy. 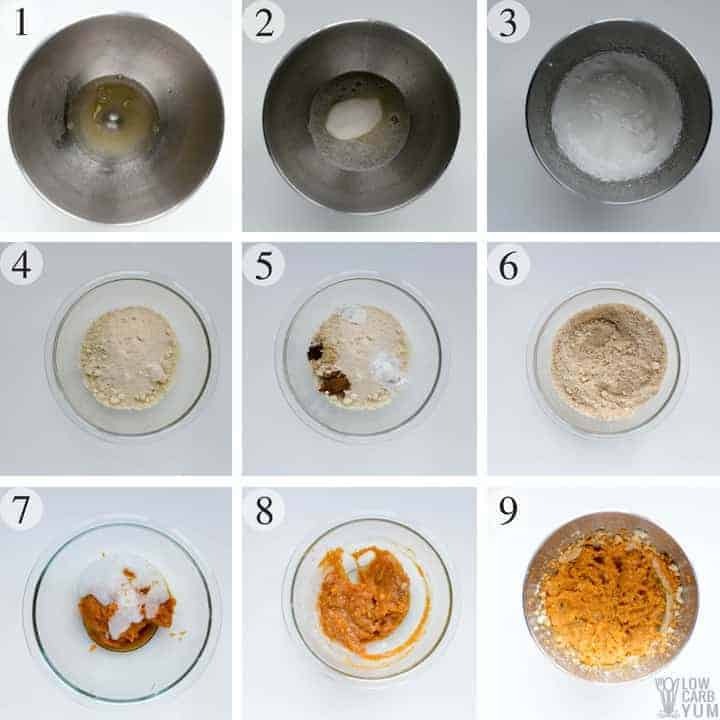 Fold the pumpkin mixture into the fluffy gelatin mixture then combine well using an electric mixer. Gradually beat the dry ingredients into the pumpkin mix. Drop by rounded tablespoons onto greased or lined baking pans. Press down slightly using fingers. Bake at 350°F for 12 to 15 minutes. Allow cookies to cool completely before removing from pan. To speed things up, you can put them in the refrigerator. If using the glaze, combine all the glaze ingredients in a small bowl then drizzle onto cookies. Store cookies covered in the refrigerator.